Let’s face it, when it comes to superheroes, Batman is the best. He wears an awesome Batsuit and he always retains his composure. Whether you’re a toddler of an adult, everyone wants to be Batman. The best thing about the Batman costumes is that they come in all sizes from babies to adults and everything in between. ⇒ Want to see all the top-rated Batman costumes? Click here. 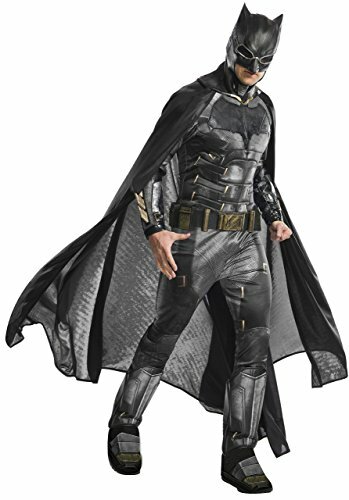 ⇒ This boys costume is a modern version of the 1960’s Batsuit with the gray, blue and yellow colors and the modern twist of including the sculptured muscles. To see the price, Click Here. Following on the success of the comics, the first time an audience really got to know Batman on the screen was the 1960’s TV show. 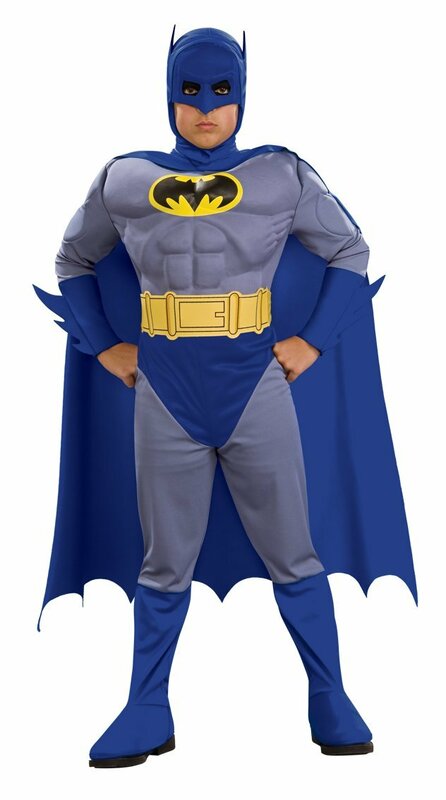 Batman’s costume was the traditional gray color with the sculptured blue cowl and cape (separate pieces) and the touches of yellow on the chest with the black bat symbol in the middle and the yellow belt with gold buckle. He also wore blue gloves. This costume was the most colorful of all the batsuits. Batman: The Brave and the Bold is an animated TV series which began on Cartoon Network in 2008. The Batman costumes in the animated series are reminiscent of the original Batman costumes which appeared in the 1960’s TV show with the more colorful appearance. 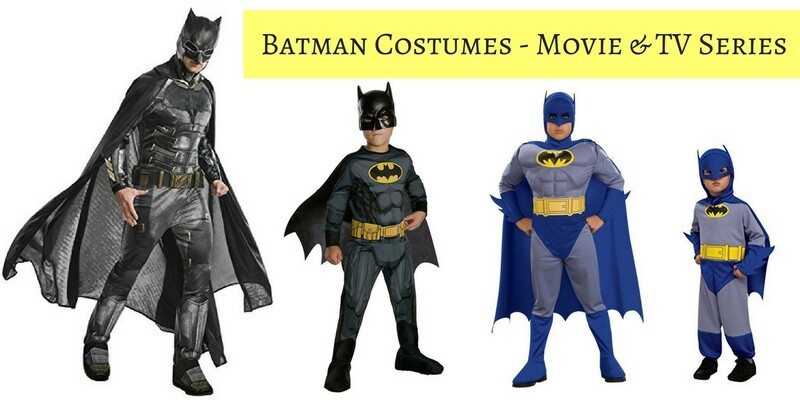 If your child has seen these cartoon episodes, they may prefer these Batman costumes, rather than the black ones that are more popular with older children and adults. The first feature Batman movie was seen in 1989 called simply, Batman. It was directed by Tim Burton and was followed by the 1992 Batman Returns, the 1995 Batman Forever and 1997 Batman and Robin, all directed by Burton. There were three different versions of the Batsuit during these films. The first two saw the beginning of the black Batsuit but it still retained touches of the yellow color on the chest and belt. This was also the first time we saw the sculptured abs as part of the Batsuit. In the Batman Forever and Batman and Robin movies, the suit became modernized. The sculptured muscles were emphasized and there was an aerodynamic appearance in the style. Some fans think the Batsuits in these movies went too far from what Batman should’ve been. But, let’s remember, it was the 1990’s and we were following on from the bold fashion styles of the 1980’s so it was probably natural that the Bat made such a bold fashion statement. We then move into the Nolan trilogy. Christopher Nolan directed Batman Begins in 2005, The Dark Knight in 2008 and The Dark Knight Rises 2012. A lot of people have said these films were more realistic than the earlier Batman movies which appeared more comical. However, since our main character is a superhero and comic book character I don’t think that’s really a criticism of the older films. Of course, these days the Burton films are more old school because they don’t have the same special effects as more modern films. The Batman movies from 2005 onward were more armor-like. With the Batsuit becoming all black there was no room for a yellow Bat symbol on the chest anymore. Everything is much darker in these costumes. But the belt is still a gold color. Once we get to the 2016 release of Batman v Superman: Dawn of Justice we see another costume change for the Batsuit. We see a return to the gray color which, along with the black oversized Bat symbol and the black cowl, cape and gloves, provides a two tone look for Batman. He still retains the sculptured muscles and the dark appearance but it’s definitely a new look for the Batsuit by being two colors. This is still a really popular costume for Halloween this year. You’ll see authentic licensed costumes available in boys and men’s sizes. The 2017 release of Justice League saw Batman wearing very black Batsuit including a black utility belt. There is no color appearing on this costume. At times Batman becomes fully armored (still black). With the size of the muscles and the armor, you can see why this is such an impressive costume and very popular for Halloween and costume parties. 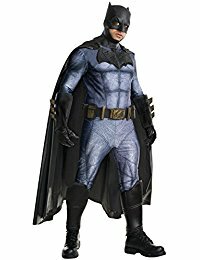 Justice League Batman costumes are available for all ages. You can easily order online. Some of the Batsuits come with gauntlets or gloves but many don’t. If you need them you can buy them separately. 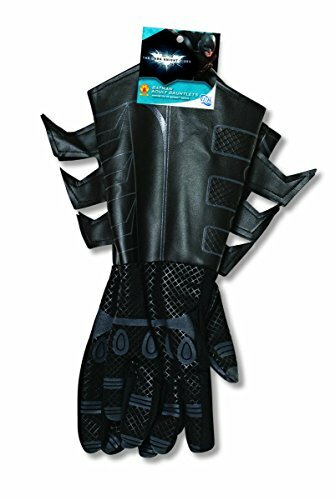 There are very impressive gloves you can buy online to complement your costume. You can also buy a Bat utility belt separately. And don’t forget your Batarangs – yes, you can get those too! 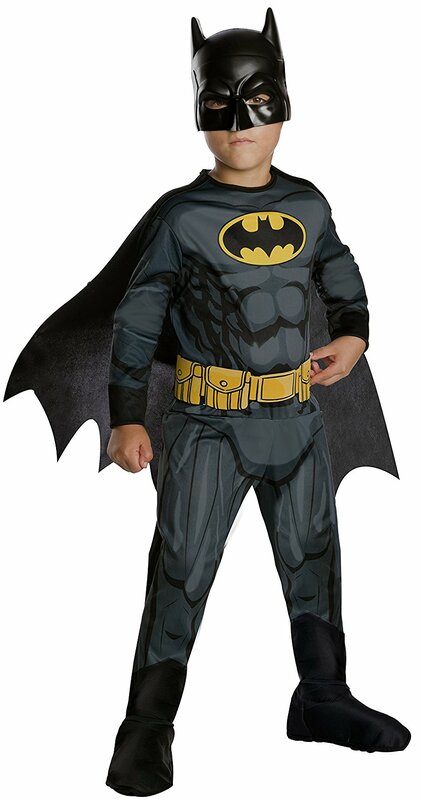 Choose your favorite Batman costume this Halloween and enjoy being the coolest superhero. If you want to dress the whole family in a superhero theme, take a look at the Justice League costumes, click here to see more. Batman is known for working alone so you’ll be justified using this as a solo costume. But remember you’ll have more fun if you’re out with other superheroes. Get friends or family involved and find all your favorite superhero costumes this Halloween. ☑ Need the the LEGO Batman Movie Costume? Click here to see the details. This entry was posted in Costumes on September 25, 2017 by Cindy.